What you need to get started with the hottest trivia game for Android! We love trivia games. Whether they be on the television or at the table-top, quiz and trivia games have been a long-time favorite for a lot of people. 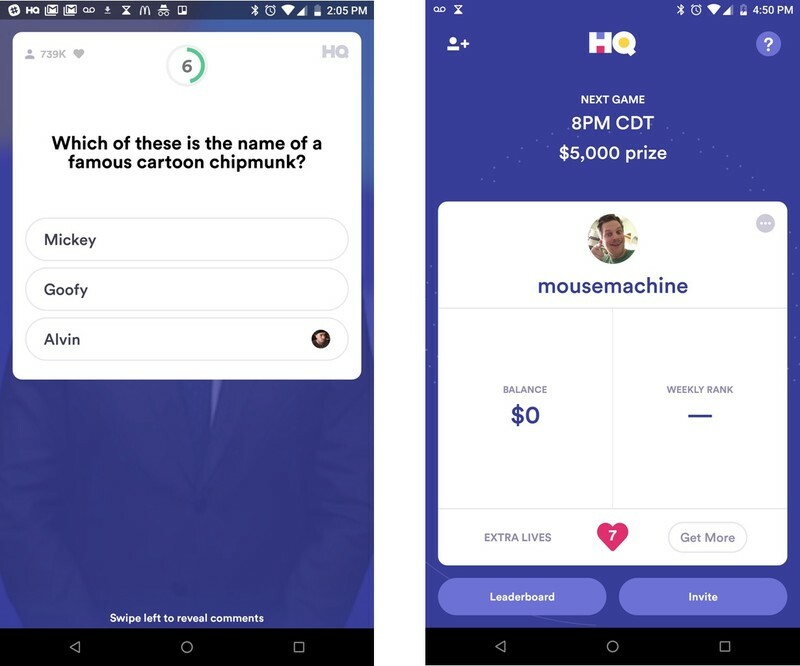 HQ Trivia is the evolution of everything from those old black and white shows from yesteryear through to today’s newest tech, all mashed together into one heck of a fun app. HQ can be a lot of fun, and with a chance to win real money — a lot of it — everyone is playing! Each game averages around one million players, with prime time and weekend games regularly surpassing two million players. Prizes range from $5,000 to $300,000 and are split between the players who make it through all 12 questions. Do you have what it takes to win HQ? June 1, 2018 — HQ Trivia is giving away big money throughout the NBA Finals! HQ Trivia has announced an insane sponsorship with the mobile game Toon Blast that will deliver some crazy big prize pools throughout the NBA Finals. Game one saw $100,000 up for grabs (with 4000 winners getting $25 each) and HQ plans to increase the prize pool by $100k per game throughout the Finals — with a potential Game Seven trivia game with $700,000 up for grabs! HQ also popped a surprise game during halftime of a new “HQ Sports” trivia game. It seemed to be a test that was made available to some players but could be a sign of big things to come as HQ continues to expand its trivia empire. The next big game is this Sunday at 9PM ET — don’t miss out! More HQ goodies are on the way, with this latest bundle launching during the Friday, May 11 game. According to HQ, it’s officially launching “Friends Friday” which will allow you to see your friends’ answers during Friday’s game. This is something we caught an early glimpse of last month, and it’s a great way to see how your friends are doing while you all play together. Also new is something called Nearby Freinds. If other people are playing HQ around you but aren’t in your address book/contacts, you’ll still see them pop up during a game. Interested in participating in the HQ phenomenon? Here’s everything you need to get started having fun and winning some cash. Think of HQ Trivia as a live game-show app. It’s very much like Jeopardy! except you don’t have to fly to a TV studio to get in on the action and play. Twice on weekdays at 3 pm and 9 pm Eastern, a host hands out multiple choice questions on a wide range of topics and you answer as best you can. Get all 12 correct and you win a share of the pot. Get a question wrong, and you’re out for the session and will need to wait until the next round to try again. That’s the easiest part! HQ Trivia for Android is officially out of beta so all you need to do is fire up the Google Play Store app! Downloading and installing HQ Trivia is completely free. You’ll need a unique username and a phone number to get started with HQ Trivia. You sign up right inside the app and it is the first thing you’ll be asked to do when you open it. When a game isn’t in session, opening the app tells you when the next one starts and lets you see your total winnings or look through the leaderboards. Be sure to read the terms and conditions before you go any further, and after you’re properly signed in you are asked f you’d like to receive push notifications letting you know when games are about to begin so you can get in on the action. Right now HQ Trivia is free to play and free of any ads. Make sure you’re signed in on your phone and every day at 9 pm and weekdays at 3 pm all you need to do is open the app to get started. You’ll be asked a question and given three possible answers. Questions cover just about every topic imaginable and just like the game shows you’ll see on TV they can be hard or they can be easy, but get progressively more trivial as the game goes on. Answer correctly before the 10-second timer runs out and you move to the next question. Get it wrong or take too much time and you’re out of the game, but can keep watching to see how many people win. There’s a live chat during each game if you want to be a little social, but you can also swipe it off the screen if it gets too distracting. Even if you get eliminated early you can keep watching — and finding out how many lucky dogs make it to the winner’s circle is the fun part! Like any good game worth its salt, HQ Trivia gives you extra lives. If you have an extra life while you’re playing a game, you get a chance to answer a question wrong or take too much time and not be ejected from the game. If that happens and you have an extra life on your account, you’ll get the option of spending your extra life to stay in the game. You can only spend one extra life per game so make them count! You earn extra lives by referring your friends to HQ Trivia. For example, if you used the referral code crackberry kevin I’d get a free life. Go ahead and try, I’ll let you know if it worked. A lot! While HQ Trivia is free to download and play, you can win real money if you make it to the end of a game. The cash prize for a basic weekday game starts at $5,000 and is split evenly between everyone who survived the 12-questions. On the rare occasion that everyone is eliminated, the prize rolls over to the next game. It keeps going until someone wins. Sunday games are typically in the $25,000 range or more and often go up to 15 questions and HQ has started regularly involving a special guest host for Wednesday games with the cash pool rising exponentially. Most recently, Dwayne “The Rock” Johnson hosted a $300,000 game in part to promote his film Rampage, and HQ regularly drops hints about future surprises on Twitter. 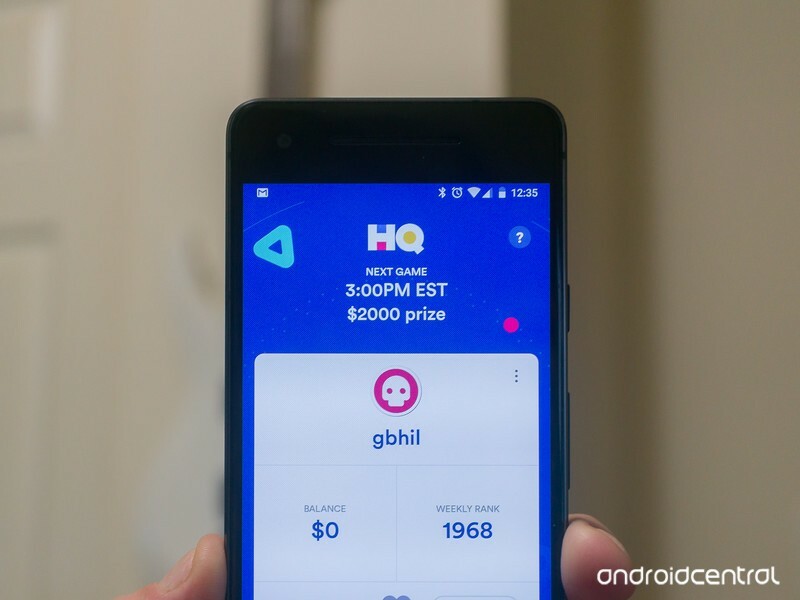 HQ used to have you wait until you hit the $20 mark you can cash out via PayPal, but they’ve changed the rules so you can cash out your winnings no matter the prize amount. You won’t need to enter a credit card or pay anything to play. Update June 2018: Added the latest info on the big payouts being offered during the NBA Finals! ← OnePlus 6 vs. Samsung Galaxy S9+: Which should you buy?